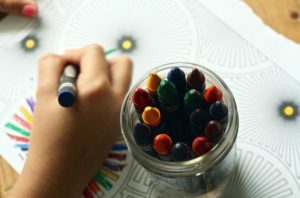 Play therapy is an experiential form of counseling that helps children bridge the gap between experience and thinking and the concrete and abstract. Adults process through their experiences by talking about their thoughts and feelings with others. Children, however, are not developmentally able to fully talk about their experiences with understanding. Instead, they act out their thoughts and feelings through play. Therefore, play therapy focuses on experiencing because children use toys to say what they cannot say with words. By accessing a child’s anxieties and fantasies through play, I can help deal with the antecedents to behavioral, emotional, and psychological issues at the forefront.In my therapy with children, I often use what is commonly known as a sand tray, a well-researched and highly effective modality that helps children quickly access deeper aspects of themselves. In my office, you will notice the presence of a sand tray and a multitude of miniatures that are part of this approach. During a typical play therapy session, miniatures are placed in the tray, creating a story or anecdote that help me investigate the child’s deeper emotions and thoughts.